The day before Thanksgiving—known as Blackout Wednesday—is the biggest drinking day of the year in many areas of the United States. But why has this hump-day holiday become the most popular day to binge drink? With much of the workforce being off for a long weekend, people may feel inclined to drink without having to manage the ill-effects of too much alcohol at the office the next morning. The prospect of a large, filling meal and extra family time the next day may push people to drink more than they usually would. And, college students on break may view the Thanksgiving holiday as the last opportunity to party before their upcoming stretch of finals. What began as a college student tradition to kick off the long holiday weekend has quickly become a full-blown marketing opportunity for bars, clubs, and restaurants across the country. In fact, Blackout Wednesday is becoming so popular that businesses licensed to sell alcohol actively prepare for the rush and even capitalize on the booze-fueled evening through targeted marketing campaigns to patrons—and it works. A study conducted by Upserve found that beer sales increased 270% and liquor sales by 114% on the Wednesday before Thanksgiving. Additionally, growler sales increased by a staggering 658%, while food orders only increased by 28%, suggesting that “Blackout” Wednesday is living up to its name. But bars and restaurants aren’t the only ones taking advantage of Thanksgiving Eve drinking. 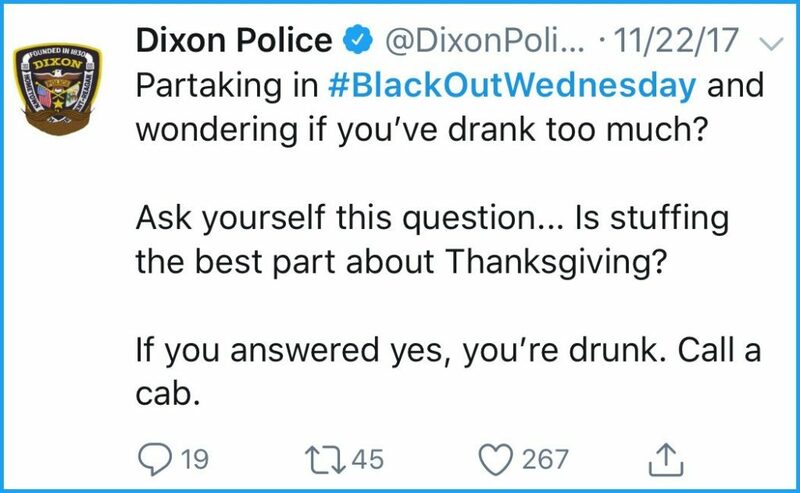 With over 10,000 #BlackoutWednesday posts on Instagram alone, law enforcement agencies across the country are taking notice and even have their own social media messages to send, like the Dixon Police Department in Illinois. As people begin to publicize their plans for Thanksgiving Eve across Twitter, Facebook, and more, police are also increasing their patrols and sobriety checkpoints. Many jurisdictions are also participating in NHTSA’s #BoycottBlackoutWednesday campaign to help spread awareness and combat drunk driving on this night of overindulgence. Blackout Wednesday may be the biggest drinking day of the year, but it is only the beginning of the dangers of drunk driving during the Thanksgiving holiday period. According to the National Highway Traffic Safety Administration (NHTSA), over 800 people were killed in drunk driving crashes during the Thanksgiving holiday period between 2012 and 2016. Additionally, one-third of all fatalities during the 2016 Thanksgiving holiday involved drunk drivers. Help keep yourself and others safe on Turkey Day and visit this Thanksgiving and Drunk Driving Resource Center to learn more about Thanksgiving drinking and driving.